Whether you're an armchair tourist, are visiting Rome for the first time, or are a veteran of the city's charms, travelers of all ages and stages will benefit from this fascinating guidebook to Rome's ancient monuments. Rome Alive describes the Site and Foundation of Rome, Walls and Aqueducts, the Capitoline Hill, the Roman Forum, the Upper Sacra Via, the Palatine Hill, the Colosseum Area, the Imperial Fora, the Campus Martius, the Forum Boarium and Aventine, and the Circus Maximus to Tomb of Scipios, all using the words of the ancients who knew them best. Aicher's commentary orients the visitor to each site's ancient significance. Photographs, maps, and floorplans abound, all making this a one-of-a-kind guide. 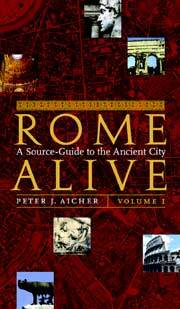 The second book by Peter J. Aicher is titled Rome Alive A Source-Guide to the Ancient City Volume 1. This book brings together a guide to ancient Rome with Ancient sources in translation with modern commentary, photographs, maps and floor plans. It is a good field companion for investigating ancient Rome. It describes the site and foundation of Rome, walls and aqueducts, the Capitoline Hill, the Roman Forum, the Upper Sacra Via, the Palatine Hill, the Colosseum area, the Imperial Fora, the Campus Martius, the Forum Boarium and Aventine and Circus Maximus to Tomb of Scipios — all using the words of the ancients who knew them best. This book is definitely for the real student of history who isn’t content with just a brief description of each historic sites. It would be good to have this book well in advance of a trip to Rome so that the information might be checked out before actually being in Rome. In the ‘alive’ of the title and the blurb ‘exciting field companion’, the publishers may be overreaching themselves. The book is not ideally suited to be used while walking around Rome: as A himself says, he has taken no account of the current state of the remains in compiling it; travellers using A’s thematically-arranged survey of the Forum to guide their steps would move in repeating circles like spirographs. The sources are efficiently translated, and Greek writers (including Procopius) given their due place. It may be objected that a book primarily about buildings ought to have many more pictures. However, it is so easy to access images on the computer that the expense involved in producing (and buying) a fully illustrated book hardly seems justified. The commentary contains material both useful and interesting (e.g. on why the Romans might not have been as much in danger of lead poisoning as is sometimes supposed, p. 26). Perhaps inevitably, there are some simplistic comments on the unpopular emperors. Dates are not always given (the date of Verres’ praetorshipis missing on page 104, and a reader new to the subject might think that it was before 117 BC, the date of the rebuilding mentioned in the following extract). There are a number of irritating small misprints and some significant ones: for example, on page 224 Claudius is reigning in AD 32. This book is not one to give out to individual students, but many school or university departments and libraries would be well advised to get a copy, especially if they do not already have Dudley’s Urbs Roma, which, at least according to this book itself, went out of print in 2003. It would be extremely useful for those studying the city of Rome for A-level Ancient History or at university, and very helpful for those studying Augustan poets or satire. It could also be profitably used, with some guidance from the teacher, by those doing coursework for GCSE Latin or Classical Civilisation. A has produced a valuable and intelligently compiled book; it is a shame that his publishers seem to have both skimped on proof reading and misjudged its real utility. Review posted on 22 June 2005 at: http://lou52.blogspot.com/2005/06/rome-alive.html Rome Alive Lately I've been reading Rome Alive by Peter J. Aicher. It claims to be "a source-guide to the ancient city," but its benefits go well beyond researching a visit to Rome. The book consists of two volumes. Volume I is the guide and includes maps, summaries, and English translations of the Latin and Greek sources for most of the ancient Roman monuments. Volume II includes the same maps as the first volume, and provides the original language text for the sources quoted in the first book. As I said before, this book is beneficial not only for the traveler, but for others as well. I would recommend Rome Alive to anyone who teaches Latin (even Greek) or ancient Roman history. The supplementary volume II is an excellent resource for teachers who want to give their students the opportunity to dig out facts and do simplified research from the original language. Aicher's writing style is easy to read and gives the reader such clear and interesting information that it is hard to put the book down! The more I read, the more I wanted to continue. His source translations are also beautifully rendered, consistent with the tone and intention of each author. Maps Rome Alive begins with an overview map, which highlights the areas covered by the smaller maps throughout the book. This overview map is helpful for visualizing Rome and its major divisions. It is according to these divisions that Aicher divides his book into chapters. Each chapter opens with a numbered map encompassing the monuments to be discussed within, and the sources are numbered in correspondence to the numbered location on the map. Aicher not only explains the locations of the ancient sites in relation to each other, but also in relation to what stands in Rome today, both on the maps and in his summaries. Additional maps are provided as needed throughout the chapter, again numbered for easy reference to the source texts. Many of the maps in volume I are also duplicated in volume II. This facilitates reading by providing visual context for the explained monument. Pictures Peter Aicher includes not only a plethora of maps and illustrations, but of photos of Rome as well. Each picture seems to have been carefully chosen and placed, for each adds to the reader's understanding as he progresses through the book. For a visitor to Rome, these pictures would leave no question in his mind as to whether he were indeed glimpsing the remains of what the ancient Romans described in the sources given. I personally appreciate Aicher's including clear pictures of the aqueducts' channels; despite all of the ancient description I'd read, I did not have a clear idea until seeing the included photo. After reading the sources, referencing the maps, and studying the pictures, I am amazed at how much deeper my understanding of the technology and architecture of Rome is. Summaries As each new site is introduced, Peter Aicher begins with a summary of the information about the location. These summaries are short and easy to read, but give the reader a skeletal understanding of the site, which is fleshed out as the reader works his way through the sources. Aicher's summaries are true to the sources, and it is here that he addresses the socio-political issues that often impacted the inception or destruction of Roman buildings. It is in these summaries, also, that he addresses discrepancies in the sources. Sources The sources included in Rome Alive are the real reason I am so enthusiastic about this book. The real meat of the book is found in these. Aicher has sifted through mounds of primary sources and extracted just the right amount of the most pertinent information for each of the sites he covers. Because he references not only the author and work but also the line numbers for each source, it is not difficult to look up the complete source elsewhere for greater context of the excerpt. Aicher has translated the sources wonderfully, rendering them into easily read idiomatic English. An example of his careful translation can be seen in the rhyme of this excerpt from Suetonius' Nero (39.2): Nero proved surprisingly tolerant towards those who made him the target of their witticisms and verse-lampoons. There were many of these in circulation, in Greek as well as in Latin. The following about the Golden House is one example: Rome is now a private home, It's time to emigrate - Assuming other lands exist When they finish this estate. While the sources in volume I have been translated into English, I can't begin to express how easy it is to cross-reference them with their original language text using volume II. Because each source in volume I is numbered (according to the monument number on the maps) and the corresponding Latin or Greek source is given the same numbering in volume II, checking the original text is extremely simple. This is my favorite aspect of the set - and what makes these books such an amazing resource for teachers and students alike. Inscriptions As a visitor's guide to Rome, some of the most valuable references Peter Aicher includes in Rome Alive are his translations of the monuments' inscriptions. When I visited Rome, I wished I knew what the monuments said. Later, when I had learned Latin, I tried to decipher the inscriptions but found the abbreviations difficult. Peter Aicher has included not only the text of the inscription (with the lengthened forms of the abbreviated words in parentheses), but the translations of the inscriptions as well. Understanding the inscriptions on the monuments makes viewing them more interesting and fulfilling. Having read the history of the monuments, understanding why they were built, and how they impacted the Romans' lives will make a visit to ancient Rome more memorable and substantial. For anyone interested in learning about Rome or her language, I recommend Rome Alive. For anyone who teaches Latin or Roman history using primary sources, this book is a must-have. With this anthology of ancient tests about Rome, Aicher, associate professor of classics at the University of Southern Maine and author of Guide to Aqueducts of Ancient Rome, seeks to bring to the fore what the natural and architectural monuments meant to those who lived in the city or who read about it and felt its influence in distant regions of the empire. The first volume presents introductions to and translations of ancient sources under eleven major headings (with 131 sub headings): the site and foundation of Rome, walls and aqueducts, the Capitoline Hill, the Roman Forums, the Campus Martius, the Forum Boarium and Aventinem and the Circus Maximus to the Tomb of the Scipios. The second volume will contain the ancient Greek and Latin selections in their original languages. Rome alive; a source-guide to the ancient city; v.1. Aicher, Peter J. Bolchazy-Carducci Pub., ©2004 343 p. $29.00 (pa) For travelers to Rome, Aicher (classics. U. of Southern Maine) assembles written sources from classical times revealing what the sites and structures meant to people before they were picturesque ruins. References point readers to modern editions of the full texts. The second volume presents the texts in Latin or Greek for students of the classics. Rome Alive Peter J. Aicher Bolchazy-Carducci Publishers, Inc. 1000 Brown Street, Wauconda, IL 60084 0865164738 $29.00 www.bolchazy.com Compiled, organized, and enhanced with occasional black and white maps and illustrations, Rome Alive: A Source-guide To The Ancient City, Volume 1 by Peter J. Aicher (Associate Professor of Classics, University of Southern Maine) is a superbly presented tourist and "user friendly" travel guide for anyone aspiring to experience Rome's rich historical past, as well as the enshrined legacy of its contributions to art, culture, science, politics, and so much more. Expert commentary and informative insights on the diverse landmark locations (complete with their historical backgrounds), combine in a travel guide that is as enjoyable for the armchair traveler as it is usefully practical for those who seek to experience Rome's majesty on-site and at firsthand. Not included on the Amazon posting . . . Also very highly recommended is Professor Aicher's previous work: Guide To The Aqueducts Of Ancient Rome which is availably in both paperback (0865162824) and hardcover (08651-62719) editions.